Etro Spring 2012 - Milan Fashion Week. The roaring 20s are making their presence felt on the runways this spring season as fashion designers find this period a great muse. 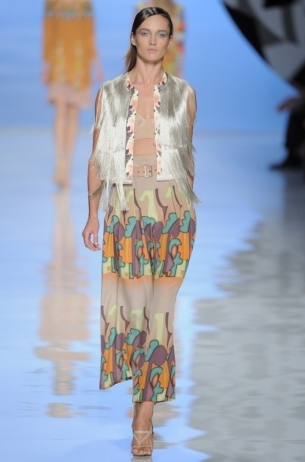 Etro has upgraded 20's flapper girl dresses to suit the new trends, so check out the label's new collection for spring 2012 and pick your favorites! 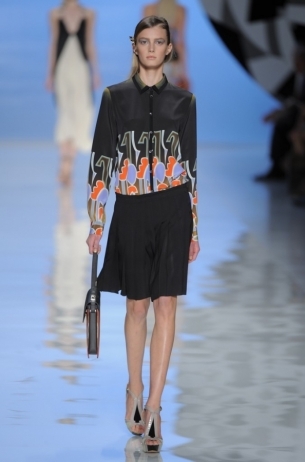 Vintage is still the buzzword in fashion this spring 2012 season as fashion designers seem to find this period very inspirational. The heavy dose of elegance exuded by vintage designs is indescribable and Veronica Etro wanted to capture that feminine-vibe, that elegance which dominated the 20s in her spring 2012 collection and the result was simply fabulous. 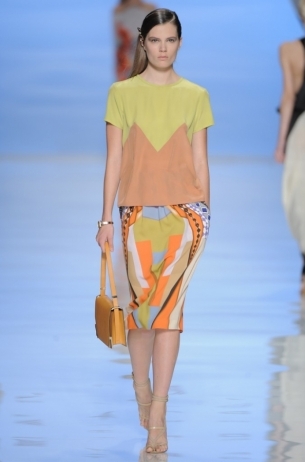 Flirty prints, fun colors and flowing, lightweight fabrics accentuate the feminine style of the collection, but according to Etro's creative director, the collection is not meant to be romantic. Inspired by the futuristic paintings of Fortunato Depero and by the label's design archive, Veronica Etro opted to switch up prints for the new season, decision that led to the creation of a fun and festive collection. Detailed colorful parsley prints dominated the designs and gave them a high dose of sophistication, while ombre hues and fringe details adorned on the designs emphasized the collection's playfulness. Almost the entire dress collection conquers from first glimpse, being a perfect match for women who wish to accentuate their femininity and make a fashion statement at the same time. The bold, powerful approach of the collection is underlined by the amazing cut out details, embellishments as well as stylish shorts ensembles that cannot be ignored, so Veronica Etro managed to create a perfect balance between the designs. From monochrome hues to stylish pastels, the collection combines warm and cool tones that are just a delight to watch and that suit the new tendencies perfectly. 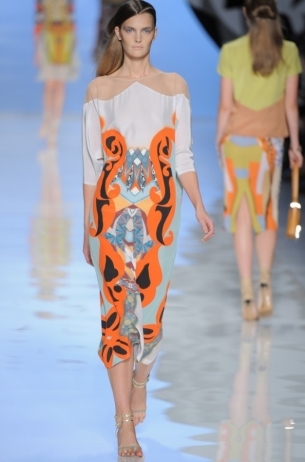 Variety is always a positive thing, so check out the new collection signed Etro spring 2011 presented at Milan Fashion Week and pick your new season favorites.